For over a month a little link for the Murakami Takashi Print Archive remained hidden at the bottom of the Sugimoto68 homepage. Desperate to finish sooner, I constantly felt like Ambassador de Sadesky in Kubrick’s prescient masterpiece, Dr. Strangelove. 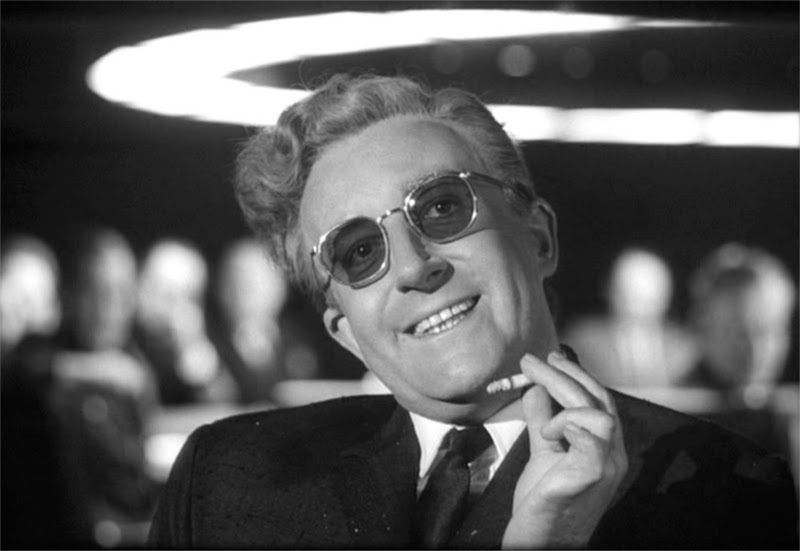 Dr. Strangelove: Of course, the whole point of a Doomsday Machine is lost, if you keep it a secret!! Why didn’t you tell the world, EH? Sweating under a narrow deadline, I continually wondered what’s the point of a hidden archive? Since the archive no longer is hidden, this Dr. Strangelove introduction leads us to a non sequitur announcing the official opening of the unofficial Murakami Takashi Print Archive!! What is the Murakami Print Archive? The archive is a reference database for collectors of prints that are produced by Murakami’s company, Kaikai Kiki. It is an independently created database sourced from data openly available from Kaikai Kiki, and partly inspired by Tagboat’s Yayoi Kusama Prints All Data. The aim is to list each print’s specifications and historical data. This database will only list prints produced from 2009 to the current year as no comprehensive reference to these prints exist. Prints from 2008 or earlier appear in Takashi Murakami Prints: My First Art. Please note that the archive prices do not typically reflect the current retail prices of the prints. If you are interested in a particular print, please visit the Sugimoto68 shop. If the print you are looking for is not available, please use the contact form to ask about a particular work. Note for collectors seeking any Murakami print edition sold within the last year: The shipping date for new prints typically is unknown. Since prints can ship extremely late, it may be six months or even longer before Kaikai Kiki ships any new print releases. Take care if you decide to purchase the most recent prints from a 3rd party seller. How do I read the archive? The number preceding the title of the print is a reference number based on the date. The letter(s) at the end have no meaning; they simply determine the order of each item. As explained in It’s the writing, not the copyright, right?, the copyright date refers to the first appearance of the image in an earlier work. The title in Japanese. No Japanese title appears when the work does not have a unique Japanese title. The date refers to the date of sale: year/month/day. Prints can ship days or even years after orders are taken. 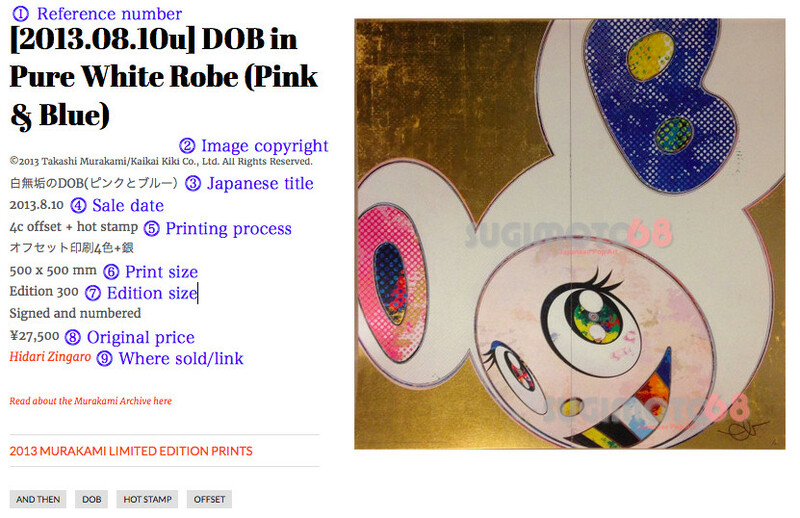 For instance, Murakami took orders for Yellow Dob on July 10, 2011; however, the prints did not ship until June, 2012. In many cases, unique printing processes make Murakami prints special. There are offsets (machine printed editions of 300) and silkscreens (handmade editions of 50 to 100). Murakami uses a number of processes, however, as of this writing no reference exists to explain in detail methods such as ‘cold stamp’ or ‘UV coat’. Further complicating the picture is that since 2013, Kaikai Kiki descriptions have inaccurate/incomplete descriptions of the processes used. For instance, while DOB in Pure White Robe (Pink & Blue), pictured above, clearly has a special gold background, the printing process is not described. The description appears neither on the website of Murakami’s gallery Hidari Zingaro nor on the documentation accompanying a print. Hopefully in the future this situation will be rectified. The dimensions of the print in millimeters. The number of prints created. The prices listed are the original selling prices of the prints. Popular prints such as Dobs, flowers or recently, 727s immediately sell out or up to the next higher price tier. For instance, the 727 silkscreen which opened at 276,500 yen now sells for 546,500 yen. As a result, the archive prices do not typically reflect the current retail prices of the prints; good examples of the price shifts appear in Hidari Zingaro’s 2015, Prints and Silkscreens that Became Expensive exhibition. Whenever there is definitive documentation for a print’s price, the price is simply listed, for example: ¥27,500. In cases where an estimate was made, the price appears preceded by a tilde: ~¥27,500. Estimates are based on the confirmed price of similar prints released in the same year or on documented reference prices that may not necessarily represent the first price of a print. This describes the original place that the prints were sold. Since 2010, virtually all Murakami prints have been released at Murakami’s Hidari Zingaro or Oz Zingaro galleries in the otaku Utopia, Nakano Broadway in Tokyo. From 2007 to 2009, prints were sold by lottery on the Fashion website Honeyee. As a reference, each entry links to the original sale announcement page for the print whenever possible. A handful of sales from 2010 onward do not have links, and 2009 listings from Honeyee no longer exist. How do I use the archive? C) Use the tags in the listings to isolate and browse specific Murakami themes such as flowers or and then and then. D) Use the search box at the bottom of the page in the footer. Enter your keyword and “archive”. For example, input, “archive jellyfish” to find all of the Jellyfish themed prints. All information is based on information directly from Murakami’s Hidari Zingaro or Oz Zingaro webites, in addition to print documentation such as order forms and invoices. As explained in ⓼, referenced prices are accurate. Estimated prices will error on the high side. Printing process information should be accurate for all editions through 2012. As explained in ⓹, data provided by Kaikai Kiki for prints produced from 2013 onward is inconsistent. Offset/silkscreen information is accurate. In the case of prints with or without “cold stamp”, corrections have been made based on physical inspection of the prints—so references to cold stamp are generally accurate. Other processes such as “hot stamp” are harder to identify, so such references are likely to be incomplete or inaccurate. Thank you very much for visiting the archive. Feel free to leave comments, make suggestions for improvement or ask questions via the contact page. If you wish to purchase a print, please visit the Sugimoto68 shop or make an inquiry via the contact page. Post revised 2018/3/9 to state that any recently released Murakami prints may be shipped late. The Nakano Broadway link has been updated.